This latest edition of MSI Minute brings you good news. 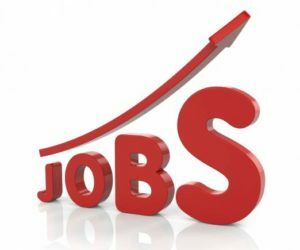 The US economy added 304,000 jobs in January, according to the Bureau of Labor Statistics, and wages are up 3.2% year over year. And some even better news, if you’re a reader in South Florida. What goes on nationwide is heightened in our region, where population is growing by the tens of thousands each year. Likewise, the job market is better than the national average. The unemployment rate for both the state and Palm Beach County is 3.3%, and Broward County’s is only 3.1% — far lower than the U.S. unemployment figure, which ticked up a point in January to 4%. Keep in mind 2.5% is unemployable so we are close to full employment. We here at MSI Recruiting see these numbers in the context of people working hard to move forward in their careers. From the windows of our downtown Fort Lauderdale offices, I can count 20-construction cranes! While that means opportunities for architects, engineers and construction workers now, it also represents thousands of professional jobs that will need to be filled by companies setting up shop in those buildings. Likewise, we see the robust economy from the perspective of both employers and job seekers. Companies need to be especially nimble yet judicious while aiming to build their A-Team under such circumstances. And even if they hold the purse strings in a tight market, top-notch candidates should still remember the fine art of negotiation. To be sure, posting a job announcement on a search engine is common practice, but that’s not necessarily going to move your company ahead. In fact, job boards often attract the unemployed or dissatisfied – not the people you want to hire. By focusing your recruiting efforts online, you’re losing precious weeks. The only way to build your ideal team is to hire well-qualified and high-performing people away from your competition. Doing so takes a team of seasoned recruiters who know how to identify and build trusting relationships with people who are actually happy in their current jobs. Over conversation and with finesse, we can entice such people to consider an even more fulfilling position with you. Wooing such candidates requires an ability to adapt to societal shifts. While money is always important, and looking toward to the future is innate in all of us, millennials seem less interested in how much money they make than Baby Boomers or Gen X. That’s not to say that signing bonuses or annual bonuses don’t count – they do. But like people, today’s hiring equation is complex. Countless surveys tell us that millennials want to work for, and shop from, companies whose values they share. They also want to feel in control of their time. While a manufacturing company needs three shifts to cover 24-hours of technical workers onsite, ad agencies, law firms and accounting practices can appeal to professionals by offering a four-day workweek with defined deliverables. Work-from-home Fridays and Paid-Time-Off (PTO) remain another perk. A word of caution to the mid-career professionals reading this: I recently arranged an interview for a client with a highly qualified candidate. It seemed like a good match until she insisted that the hiring manager meet her at her current place of employment, a request my client turned down. In my 30 years in this business I had never heard a job candidate speak so unabashedly. While this scenario is extreme, it reminds us that good old-fashioned boundaries and respect are paramount. Wherever you work, remember that someone built that company and that’s why you have a seat there. ©Copyright 2018 - MSIrecruiting.com. All Rights Reserved.